Like any good beekeeper, we had read a lot of beekeeping books. But, as we’ve found so far this year, reading about something and doing it in real life is completely different. Likewise, actually going through the process of raising a queen is just not the same as reading about it. The process can take a long time, as the queens have to develop, hatch, mature, mate, and start laying. And a lot can go wrong at any point. We humbly resigned any notion of harvest a significant amount of honey this year, and decided that we really needed hands-on experience so when we’re faced with this situation again we know what to do. Since we are managing only two hives, we could afford to take our time to focus on this one hive and really understand the process of allowing a hive to requeen itself. This would not only be beneficial to a full working hive, but also to raising nucs and queens. So while requeen with a mature queen would have short-term benefits to allow us to collect (and sell) a lot of honey, the long-term benefits to us becoming better beekeepers through this experience would surely be worth it. Knowledge is worth more than honey anyway. After realizing the colony was raising supersedure cells, we looked through the hive for the queen to be sure we didn’t accidentally kill her. Sure enough, she was there. We didn’t pinch her off, but wanted the colony to take care of the situation as naturally as possible. That would mean that upon the hatching of a replacement queen, we would have a two-queen hive. After the new queen is mated, the old queen would be killed or kicked out of the hive. So, we closed up the hive with the queen cell and let them do their thing. The next week we opened up the hive and saw the queen had hatched, but didn’t take the time to track her down. The next week we again checked the hive. We saw no queen and no eggs. Hmmm. It had been rainy weather, so perhaps her mating flight was delayed and we just missed her when inspecting? Another week went by. Again, we did not find any queen – new or old. And no eggs. Crap. Our plan to allow the hive to raise their own queen was not panning out. And the hive was out of eggs to raise new queen cells. Meanwhile, the nuc that we made a couple weeks prior was doing great. The queen had hatched and was starting to lay. We decided to use this nuc as our backup plan, and merged it with the hive. Next, place the new colony on top of the newspaper. That’s it! The process of merging two colonies is quite simple. We opened the hive and removed the inner cover, replacing it with a sheet of newspaper. Next a hive body containing the nuc and empty frames was placed on top of the newspaper. The excess newspaper was cut off, and the inner and outer covers were put on. The newspaper acts as a barrier so there is no fighting between the two colonies and to also protect the queen. The bees will chew through the newspaper, allowing the pheromones of the two colonies to mix. By the time the holes in the newspaper are big enough to pass through, the bees are familiar with everyone’s scent and there is no fight and no killing of the queen. We placed the inner and outer covers on and let the bees do their thing. The fully merged hive should be ready to go by next week. That was probably the simplest thing we had done all summer. If only everything else was so simple. Perhaps we should have seen it coming. Looking back, the signs were there. But this being our first year, we didn’t know exactly what was going on. We still didn’t understand bee language. It started with some queen cells in the established hive. A couple months ago we opened the hive and in the medium brood box (1 deep and 1 medium) there were a hand-full of queen cells on a frame. We thought the hive was preparing to swarm, so we took obvious preventative measures by removing the queen cells and adding a deep brood box to give the colony some room to expand. We checked again the following week, and again there were queen cells. That seemed a bit odd since they had plenty of room to expand. We figured the cells were left over from the previous week and removed them. Meanwhile, the hive seemed to be quite busy. They were packing all the frames in both the brood chamber and the super with nectar. They weren’t really drawing new comb very well, but they were really filling the hive up with nectar. After another two weeks we went back into the hive and again saw queen cells. This time they were capped. And not only that, as we were examining the frame, we saw a new queen hatching. That in and of itself was very cool to witness. But our awe was short-lived as we tried to figure out what was going on with this colony. 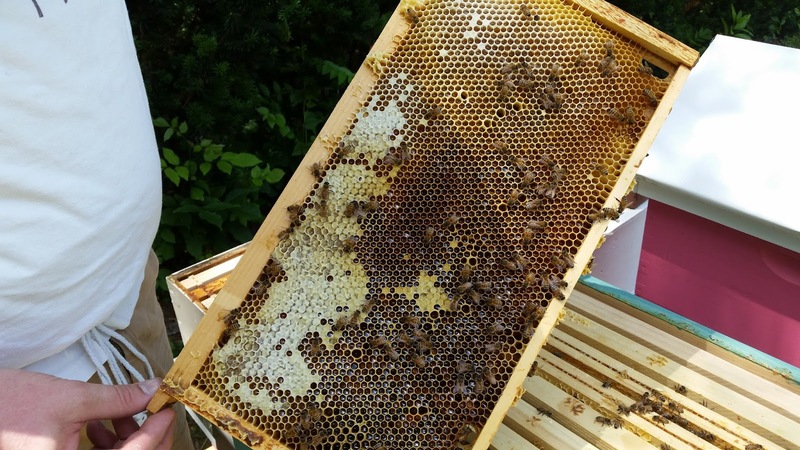 We moved the frame with the new queen plus a frames of brood, honey, and pollen to a 5-frame nuc box. Our first nuc! That was exciting. 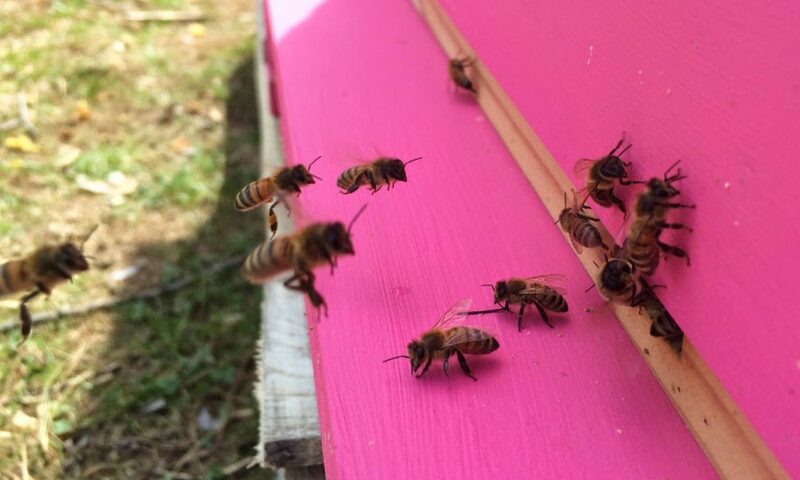 When we opened the hive up the following week there was yet another queen cell. Another one? No matter what we did the past month these girls were persistent in making a new queen. We tried giving them more room, adding another super, splitting them into a nuc. What were they trying to tell us? It was then we realized we weren’t dealing with a swarming hive, we were dealing with a failing queen. It all started to add up. The queen was supposedly two or three years old. While we still saw eggs, there were less and less opened and capped brood and more and more nectar. The laying pattern was spotty. The queen cells were on only one frame, and clustered together. And there was plenty of room in the hive. We had been so concerned with (and read so much about ) swarming that a failing queen wasn’t even on our mind. At this point we had a decision to make. Buy a queen or let the hive raise a new one? The first option is the quickest and the most fool proof. Pick up a new queen that was raised and selected by a breeder, add her in a queen cage, come back in a few days to check that she was accepted, and you’re done. The second option is much longer and far more risky. The hive will raise several queen cells. Once they hatch, the most fit queen will kill off remaining queens and queen cells, at which point she will mate and start laying. The whole process takes 3 to 4 weeks. It’s a lengthy process that can go wrong at any time. Perhaps the bees will raise sub-par queens. Maybe the queen will get killed on her mating flight. Or she may mate with an inferior drone. If anything goes wrong, the process starts over. The hive could go queenless for a couple months. In the interim a laying worker may emerge that screws the whole thing up. The whole colony could collapse and be lost. So which option did we choose? The sure-fire method that would get our hive back in shape in time to salvage the remainder of the nectar flow? Or the risky we-could-lose-it-all method that could cause us headaches and sleepless nights? Of course we picked the path that could lead to total failure. More of that in Part 2. We opted to start out with plastic foundation because it’s cheaper than wax, easier to set up, and reusable. Mostly because we’re it’s cheap. 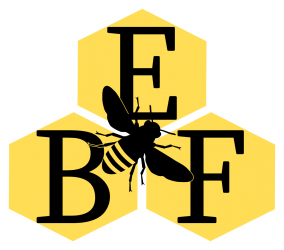 But we did do some research and found that a lot of people love plastic foundation, commercial and hobby beekeepers alike. There’s no mess wiring the frame – just pop it right into the frame and you’re done. Plus when the comb gets old and needs to be replaced, you can reuse the plastic foundation after cleaning the old comb off of it. So what’s not to like? Apparently our bees don’t like it. The hive we purchased (with wax foundation) needed to be expanded. Our package seemed to be doing well enough with the plastic foundation so we added a second deep brood box containing undrawn plastic foundation. But in the following week, they made a real mess of their comb. Between the plastic foundation the bees had built the comb perpendicular to the foundation, not parallel, in essence gluing frames together. It wasn’t just one or two frames, it was most all of them. The little that was drawn correctly was very sparse, and poorly drawn at that. A real mess. After a little research we found out we’re not the only ones that have seen this problem. While we did know that coating plastic foundation with some beeswax to encourages the bees to draw it out, we assumed the pre-coated foundation we bought was sufficient. As it turns out, while the plastic frames are coated with wax, they aren’t coated thick enough. It is highly recommended that you put an additional coat of wax on the frames. With all the messed up comb, we ended up with a fair amount of wax that we melted and used to coat undrawn foundation. With the partially-drawn frames we just shook off the bees and put a quick coat of wax on the undrawn portion. Hopefully the bees will be much happier now. We’ll post an update in a week or so to see if this actually works. We’ve only been keeping bees for a month now, so I feel it’s kind of early to pontificate about how much we learn from bees or how much they’ve taught us about ourselves and life in general. Perhaps in five or ten years I will wax poetic about how much we as humans can learn about the hidden secrets to a fulfilling life from the humble honey bee if we would only stop, hold hands in a circle, listen to the buzzing and gaze into their eyes, or something along those lines. For now, I’ll say they have taught be a small life lesson in humility (aka humiliation). I knew nothing about bees six months ago. When Andy and I decided to start this venture, we immersed ourselves into every piece of bee literature we could find. Books, forums, YouTube. Anything. We learned a lot. Everything was great on paper. We could talk like we’d been keeping bees for a decade. We knew this beekeeping thing inside and out. This was going to be easy. But then we got the bees. And half flew away. And we screwed up their feeder. And we got stung – a lot. (Some more than others. A super of bees may have been dropped in the process.) The latest lesson in humility is a rearrangement of the frames I read about, but failed to realize it was for a different purpose and definitely not when it’s 50 degrees and raining outside for days on end. Maybe someday I’ll admit the details of my mistake publicly, but for now it’s enough for you to know I may be currently killing our bees because I won’t been able to open the hive and fix my mistake until the weather clears tomorrow. 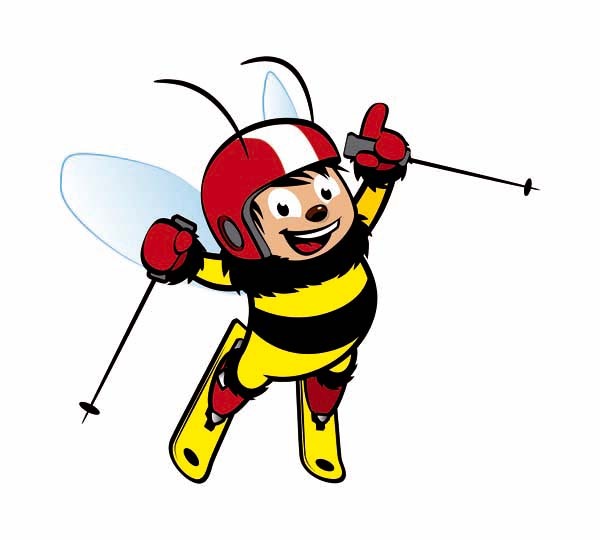 found a skiing bee on the web? a short amount of time. So far it’s been a bumpy ride with very little reward in sight. But as I was beating myself up about how terrible of a beekeeper I am (I will not say “we”, because I’m not dragging Andy down with me), I remembered the first time I went skiing. I was horrible. I literally fell the whole way down the mountain, by which I mean the almost flat bunny slope. And I did that the whole night. And the next week. But by the third or fourth time I got really good at quickly recovering from my falls. As I moved up to the black diamond courses, I noticed that the people who didn’t fall much on the easy courses had a much more difficult time recovering when they fell. Everything stopped for them while they gathered themselves and their egos together. But it was different for me. I had learned early on how to fall and recover without missing a beat. By doing it wrong so much the first time, I learned how to do it right and correct myself when I did mess up in the future. So right now when we’re abusing our bees, being terrible animal husbanders, I am working to replicate this skiing lesson with our bees, trying to take solace in all we’ve learned so far and how much better beekeepers we will be for it in the end. What’s inside? Hopefully bees and a queen. When our brand new package of bees absconded, we weighed our options. Package, nuc, pray a swarm takes up residence, give up? After much debate we decided on none of those options. We decided to just go big with a full blown hive. We found very reasonable priced hives on Craigslist from someone who was moving and could not take all of their hives. This seemed almost too good to be true. There are both advantages and disadvantages to buying a full-blown hive. A major advantage is that the bees are ready to go. There’s no lag waiting for comb to be drawn and the hive to increase in strength. We would have a pretty good chance of actually getting honey this year. And it seems likely we will be able to make at least one nuc this year. Plus there’s the benefit of having the actual hive body included. The boxes and frames themselves were almost worth the price. We also looked at the disadvantages. We knew nothing about the colony health or the queen’s history. The hive was already closed up when it was picked up, so we didn’t even know if there was a queen. But we figured that if the queen was no good or missing, we could replace her and the hive would still likely perform well this season. We also didn’t know the condition of the equipment or what treatments had been done. After talking with the seller more about his beekeeping techniques we were pretty confident the bees were well taken care of. In the end we could be buying a healthy, well oiled machine or queenless pile of mite-infested crap. Yes, it was risky. But we decided to take the chance, figuring we would be able to recoup the cost of this hive (plus loss of the absconded colony) if we could get a honey crop this year. What neither of us really appreciated, however, was that there was no more easing into beekeeping. It’s like adopting a 5 year old. There is no prepping for what to do the first time you walk into Target and they throw a fit because you won’t let them buy another piece of junk from the dollar aisle. Sure you missed all the poopy diapers, the spit up, the sleepless nights, the bottles, the potty training. At least when you’re there from the beginning you know how to handle most situations. Or it’s not as much of a shock to find the walls colored with crayons and marker, again. Our remaining package was still in the cute baby phase, drawing comb, laying eggs, a few foragers bringing back pollen. Very cute and gentle. The adopted hive, that’s a different story. Our learning curve just got a whole lot steeper. Come on, Pink! Get your act together! knowledge of bees allowed) We took the boxes apart and analyzed every frame. We saw no signs of maladies. We found eggs and larva. Plenty of honey and pollen. We even found the queen. (Whew) We reassembled the hive, putting the medium super that had been in the middle of the three on the bottom, as that is where the cluster was and we wanted to be sure they would expand into up into the deep. Then we let them calm down a little bit. After a few hours, we came back to see how everyone was doing. The new hive had already found pollen sources and were busy loading up the new hive with it. The amount of activity around the entrance was impressive. Bees flying everywhere. I then glanced over at our remaining package. Sure there were bees going in and out, but it seemed really pathetic. I found myself saying, “Why can’t you be more like your sister? She’s only been here a couple hours and is already foraging. You’ve been here a week, and what have you done?” They may need therapy after they grow up. we added the package to their new home. This was to be an easy, quick look to be sure the queen was released. As we pulled the feeder off of the brood chamber we were shocked to see… nothing. And I mean nothing. No bees, no queen. The only evidence that bees were ever there were an empty queen cage and a couple partially-drawn frames packed with a little pollen and some syrup. I felt like a groom left at the alter. What happened? In short, they absconded. Basically, the colony doesn’t like where it lives for one reason or another. It could be lack of food or water, pesky neighbors (e.g. skunks, yellowjackets, or loud lawnmowers), the smell of the new hive, overheating, or disease. When Rusty at Honey Bee Suite wrote about absconding the other week I gave her post a quick read and moved on. Why should I worry about that? Our packages were already installed, and everything seemed to be doing okay, besides the deadly feeders. But that was quickly resolved, and both hives had been eating. Even two days prior there was activity in the feeder. So why did they leave? Looking back, it could have been a number of things. The bees started out in an abusive relationship. We were unintentionally killing them from the beginning. We were also too needy. Since we were paranoid about killing them, we were opening up the feeder (but not the hive) every day to make sure everyone was doing okay. Or maybe they just didn’t like our place after they moved in. Was it the smell? We use screened bottom boards, and I have since read they can lead to new packages absconding. Next time we’ll do things a little differently. First, we’ll be sure to provide the new package with a couple of drawn frames. This should make them feel a little more at ease and not work them so hard. Second, the queen’s release will be delayed. This can be done by not removing the cork for three or four days, then allowing the queen to self release. Or you can wait a week and manually release her. Either way it will give the workers time to build up foundation. If there is more foundation, then it’s less likely they will leave. Third, we will just let them be for longer. The only visits will involve peaking at the entrance to be sure there is activity. Fourth, a solid board will cover the the screen bottom board until the colony is established. I’m not sure we’ll never know exactly why this relationship ended. Most likely that it was us, not them. Hopefully we’ll learn from our mistakes and treat our ladies better in the future. After over a year of planning, we got our brand new packages. On Saturday we picked up two 3-pound packages of Italian honeybees. We were as much excited as our wives were not. We read every beekeeping book we could get our hands on and every beekeeping blog we came across. We trolled beesource.com and were entertained for hours by FatBeeMan. This was it, the moment of truth. And then it was over. After all the work we put into making the hives, reading everything that can go wrong, and learning the biology and anatomy of Apis mellifera, we just kind of stood there thinking we should be doing something more. But what more could we do? We sprayed them lightly with sugar syrup, smacked the packages to dislodge the bees, removed the can of syrup and the queen, and dumped the bees in the hive between the center frames. The packages were set outside the hive entrances so the remaining bees could fly into the hives. We removed the cork from the candy end of the queen cage and put it on a frame with the candy side up to be sure the exit wouldn’t be blocked by one or two dead attending bees. That only took ten minutes. There had to be something else. After going inside, there was something else. There were bees still in the packages and it was getting cold. Since I can’t leave well enough alone, I went out to finish shaking these bees out, lest they freeze. Plus the bees were, like, a penny apiece, and there had to be a whole quarter still in those packages. After another ten minutes, I again decided to meddle and give the packages another shake. Did I mention we watched a lot of FatBeeMan? If FatBeeMan has stingless bees, then we must too. Plus it’s just an install. The packages of bees aren’t defensive, so who needs a veil? I did. I pushed my luck, ticked off a couple bees, and they let me know it. Once on the forehead and once on the neck. The neighbors must have loved seeing a grown man thrashing at his flannel shirt running across the front yard. After a brief roundup of the few stray bees in the house, I reflected on my idiocy. I read somewhere that when the bees sting, don’t ask why they stung you, ask what you did wrong to make them sting you. We’ll have to keep that in mind.